How long has it been since you saw a good “women in prison” movie? If it’s been too long, you can remedy that by watching Oren Shai’s CONDEMNED. It’s a short film with only four characters, but it’s very well-made and made me want a feature version, complete with all the back-story and more about what happens to Prisoner #1031 (Margaret Anne Florence). The performances are good, the production values are top-notch (the movie is very well-photographed), and the music is great. Plus you get vintage paperbacks and some fine noir dialogue. 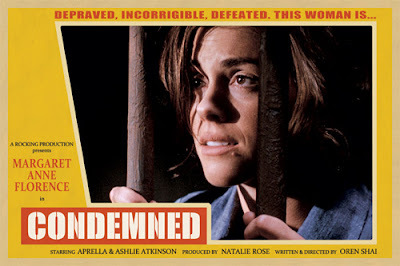 CONDEMNED is available on-line several places, but the main page for it is here. Do yourself a favor and check this one out if you haven’t seen it already. Highly recommended. This one is completely new to me. Have never heard of the title or the actress before. Actually, this one was Bill Crider's first choice in the new round of Overlooked (or was it the second?). It's well-done, though!